“The term shŏuyī (守一), which appears in Taoist literature from an early period, indicates a form of concentrative meditation that focuses all attention upon one point or god in the body. The purpose of this practice is to attain total absorption in the object and thus perceive the oneness of being.” — Livia Kohn, and it sounds wonderful, especially ‘all attention upon one point,’ and the best point which comes to the mind first is ‘breathing’. 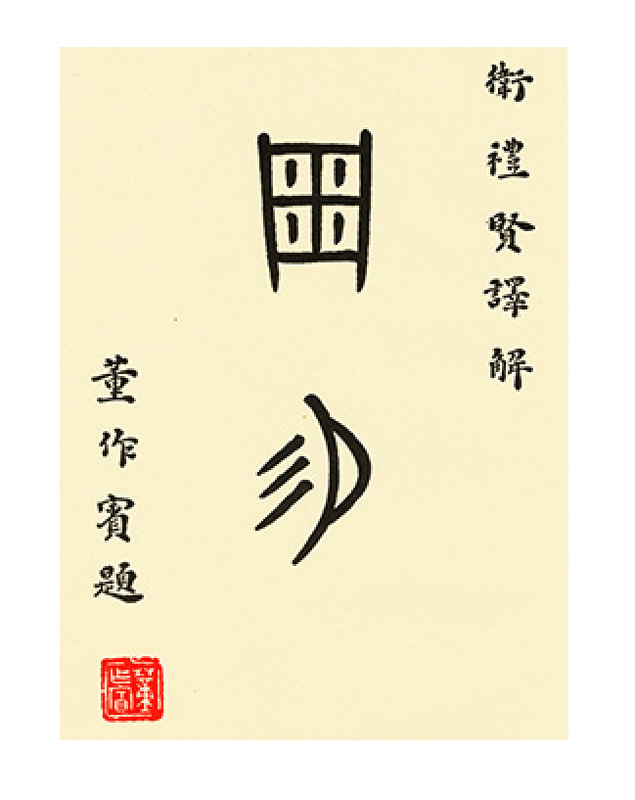 Another proof for the usefulness of such kind of meditation is another quotation: “The shift from visualization to mental tranquility continues in the Song dynasty (960-1279), where shŏuyī (守一) appears as a basic exercise in the texts of inner alchemy (neidan), whose purpose is to protect the center of life within and thus allow the transformation of bodily energies into pure spirit and Dao. In all cases, however, the term indicates one-pointedness of mind, which focuses on a single object of meditation.”— L. Kohn, one of my favorite sinologists. And guess, what? Another quotation for the first two proves for the previous quotation (Encyclopedia of Taoism, Routledge edition) is the whole chapter of Yoga Sūtra by Patañjali: ‘samādhi pāda’. God bless all people practicing yoga, they deserve it, especially after reading and getting the ‘oneness’ with the whole corpus of sutras. Of course, I could suggest now a small, collective meditation on these two cultural achievements of China and India to “guard the One,” or “to maintain Oneness” but it will look like a little bit cheap trick. What doesn’t look cheap definitely is your private experience (as well as mine) of meditation on, yes, ‘breathing technique’. For instance, when I have discovered first time that my breathing wave inside my lungs strongly resembles the feeling inside the palms in the famous exercise (you keep your palms ‘face-to-face’ for some time and when you begin move them slowly closing the space, you feel how air between the palms turns into sort of a spring, or a balloon), and that was so amazing, and I keep the feeling of this air spring every time I meet my yoga mat-à-mat again and again. By the way, you should really be in the state of deep meditation and somehow 3-5 breathings per minute help to achieve this goal. Livia Kohn has done a great job telling us, readers of encyclopedia, about different kinds of ‘observation’ in different times, beginning from the fifth century with the rise of Louguan (‘Tower of Observation”) for a Taoist monastery and leading the list of terms throughout the Buddhist influence in the seventh century and later. Zhiguan, neiguan, qiguan vs. shenguan, jiafa guan vs. shifa guan and piankong, youguan vs. wuguan and zhongdao guan, and also waiguan and yuanguan to contrast neiguan, and the ultimate technique — kongguan, or observation of emptiness. The meaning of the word ‘guan’ is ‘to look at carefully’, ‘to scrutinize’. And now we have the volumes of teachings! Why people put so much passion to make simple things so complicated! Let’s make this picture easier to understand. My favorite list of careful observations would be printed out like this: observation any cup of coffee, green or black tea, or Japanese matcha I have made during past decades; observation sky and earth, and any tree, leaf, flower, or snow every time I leave the home; observation my dreams and daoyin exercises every night and my work every day; observation every child and adult person I can meet and talk; observation my favorite ideas, books, and authors during the whole life, and observation of the hexagrams of the Book of Changes (which is probably the best item in the whole list). 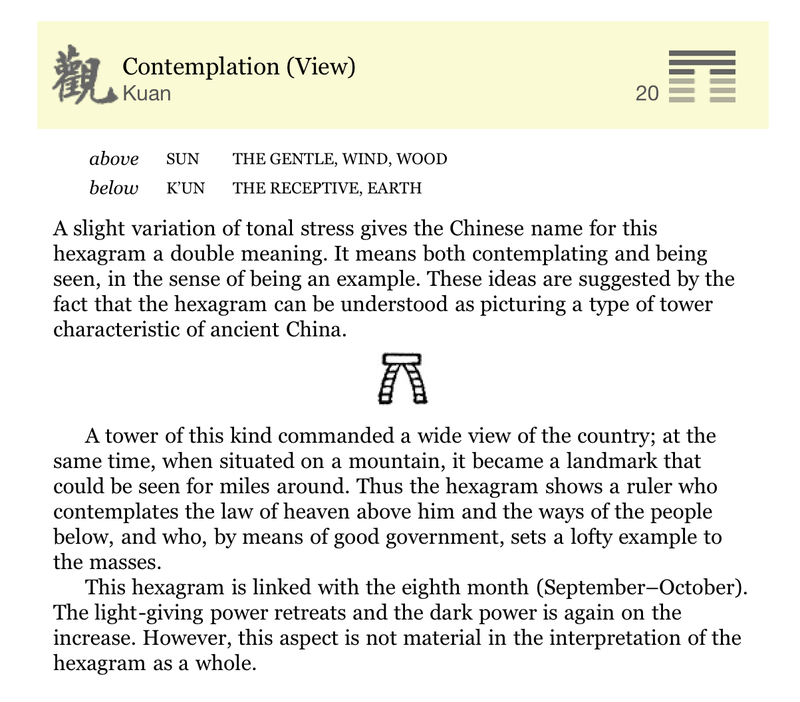 L. Kohn didn’t mention it, but the character Guān 觀 (observation) is the hexagram No 20 in the Book of Changes (I Ching).